i would jump in front of a semi for you, McDreamy. Grey's Anatomy has been a part of my life for 14 whole seasons. Based on my calculations, that's 14 years of my life. Of course, I would have only been 5 at this time, so it's not likely that I curled on my couch next to my mom with a bowl of popcorn and watched various doctors do you-know-what in on-call rooms. However, I did start watching, and when I did, I fell hard for Meredith and Derek. Who didn't? If you just shook your head no, then you're a lying liar. It sounds cheesy to say that the show changed my life, but it sure did change my perspective. Never in my life had I felt so unbelievably connected to such complex characters. Meredith was my sister, Derek was the lover I wish I had, Mark was my big brother, and Cristina was the best friend that I always needed. 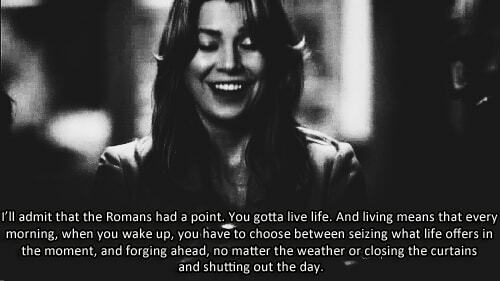 I revolved my life around Grey-Sloan Memorial, and part of me wouldn't have it any other way. That's not to say that the show didn't hurt. (I honestly don't think that anyone should EVER talk about Derek's death EVER again. I mean it.) I've lost more by watching the show than I ever did in real life. I've cried more over fictional relationships than I ever did over any of my own. That doesn't mean that I don't love this show with all of my heart. This show has changed my life. It has made me more aware, more loving, and more able to understand the differences in people and how we all fit together. We know you lost Derek, Mer, but let's be honest, we did too. I can't explain. I tried, and I can't. All I know is that I hate this show, but I also love it, and if you can't understand that, I can't help you. 3. When 14 seasons of Grey's med school feels more beneficial than years of ACTUAL med school. I mean, c'mon, even I know that Derek needed a CT.
Stop asking. I can't do it. I won't change. I will probably be buried with season 10. Judge me. Do you understand yet? Please tell me you do. 6. The first step to fixing a problem is admitting you have one. My life is a train wreck. There, I admitted it. Still doesn't change the fact that my Thursday night 8-9 is still booked solid. I'm still crying over Derek, to be honest. If you don't know who Meredith is and ferryboats don't do something to your soul, we can't be friends. Not only can we not be friends, but I'll also hit you with a bus if I see you. You'll hate your life and you'll wonder how any one person could be so cruel, but you'll also love it. You'll love it so much that it hurts. 11. The life of a Grey's fan is a lonely one. We've been through shootings, plane crashes, bombs in people, fires, more deaths than we can keep track of, the relationships of our favorite characters fall apart, and seriously, we saw Meredith tell her children that Derek is dead. We win the sucky life contest. Anything could be fixed with MerDer. 13. When You're Always Concerned About the Well-being of Your Favs. We can't lose you twice, Derek. Get your act together. We've experienced just about everything else. Where's Jurassic Park to add a little variety? Do you hear that? That subtle piano? OH GOD, WHO'S DEAD? Excellent Bros! 'Bill & Ted 3' Could Start Shooting This Year! 'I Am Legend' Writer To Take On The Overlook Hotel In 'The Shining' Sequel! How 'The Walking Dead' Season 6 Punk'd Us All (Again)!